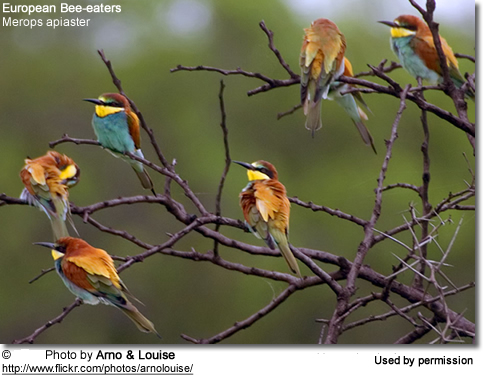 The European Bee-eaters (Merops apiaster) - also known as Eurasian or Golden Bee-eaters - are widely distributed, multi-colored bee-eaters with abundant populations in arid (dry) and semi-arid areas of southern Europe, northern Africa and western Asia. This insectivorous species has recently been observed breeding in central Europe as far north as Sweden. 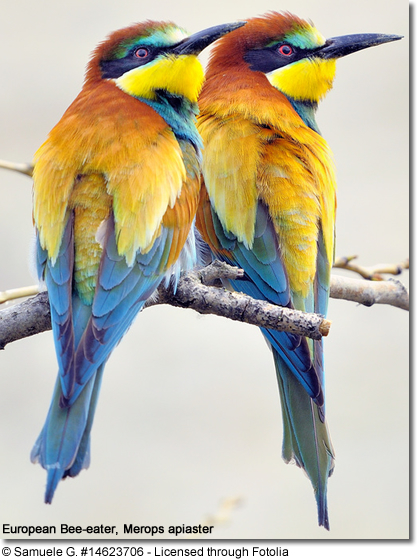 These bee-eaters tend to be shy and generally avoid humans. However, after rain in particular, they may be found close to human settlements in their search for beehives. Afrikaans: Europese Byvreter ... Albanian: Gargulli ... Arabic: ?????? ?, ??????? ??????? ?, ??????? ??????? ?, ??????? ????? ?, ????? ?????? ????? ... Asturian: Abeyeru ... Azerbaijani: Q?z?l? q?zlarqu?u ... Basque: Abellerol, Erlatxoria ... Belarusian: ??????-????????? ... Bulgarian: ????????? ??????? ... Breton: Ar gwespetaer-boutin ... Catalan: Abellerol ... Chinese: ???? ... Croatian: Pcelarica, P?elarica ... Czech: Vlha pestrá ... Danish: Biæder ... Dutch: Bijeneter ... Esperanto: abelman^gulo ... Estonian: Mesilasenäpp ... Finnish: Mehiläissyöjä ... French: Guêpier d'Europe ... German: Bienenfresser, Europäischer Bienenfresser ... Greek: (??????????) ??????????? ?, ???????????? ... Hebrew: ???? ?, ????? ???? ... Hungarian: Gyurgyalag ... Irish: Beachadóir Eorpach ... Icelandic: Býsvelgur ... Italian: Gruccione, Gruccione comune, Gruccione europeo ... Japanese: yoaroppahachikui, yo-roppahachikui ... Kazakh: ????????? ???????? ... Lithuanian: Bitininkas ... Latvian: Bišu dzenis ... Macedonian: ???????? ... Maltese: Qerd in-Na?al ... Norwegian: Bieter ... Polish: Szczurek pszczo?ojad, zolna, ?o?na, ?o?na (zwyczajna), Zolna zielona, ?o?na zielona, ?o?na zwyczajna ... Portuguese: Abelharuco, abelharuco comum, Abelharuco-comum, Abelharuco-europeu ... Russian: Zolotisatya Shchurka, ?????????? ???? ?, ????? ?????????? ... Serbian: Pcelarica, ????????? ... Slovak: V?elárik zlatý ... Slovenian: cebelar, ?ebelar, legat cebelar ... Shona: Gamanyuchi ... Spanish: Abejaruco, Abejaruco Comun, Abejaruco Común, Abejaruco Europeo ... Swedish: Biätare ... Swahili: Kerem wa Ulaya, Polohoyo ... Tsonga: Tinziwolana ... Tswana: Morôkapula ... Turkish: Ar?ku?u, aryku?u ... Ukrainian: ????????? ?, ???????? ????????? ?, ????????? ?????????? These strongly migratory birds will usually commence their journey north to their breeding territories in mid-April to late May. 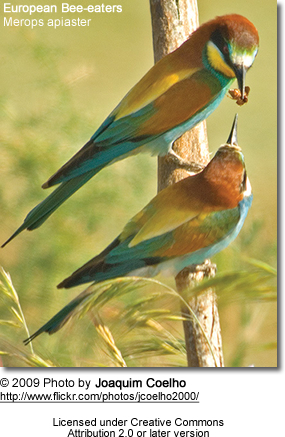 The European Bee-eaters breed in southern Europe south to northwestern Africa (Morocco east to Libya) and Namibia and South Africa. East to western Russia to central and southwestern Asia (east to Lakes Balkhash and Zaysan in Kazakhstan), south to Afghanistan and Oman. They appear to be expanding their territories into central Europe as far north as Great Britain, Finland and Sweden. 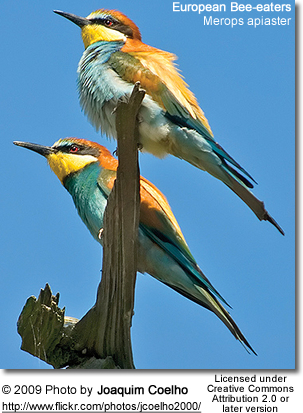 After the breeding season, the European Bee-eaters will migrate south from the second half of July to mid-August and they will arrive there from mid-September to early October (in South Africa). 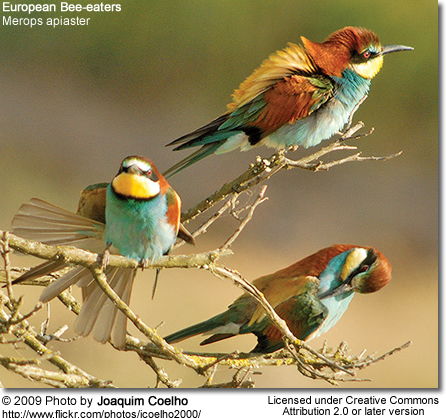 Most European Bee-eaters winter in tropical Africa, others in North-Western India, southern India and Sri Lanka (Asia birds). 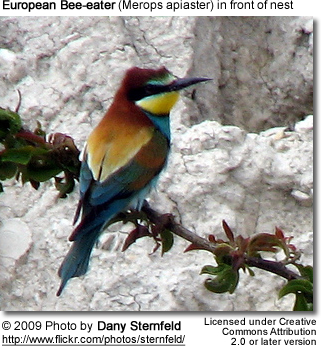 These Bee-eaters typically migrate by day in small family groups and are commonly observed along the Black Sea coast and over the Straits of Gibraltar. Depending on their range, they inhabit sheltered valleys with grassy, marshy terrain with scattered trees, sunny hillsides, meadows, pasture and cultivated land with scattered trees, plains, steppe, river valleys, shrubby riverbanks and Mediterranean macchia scrub. 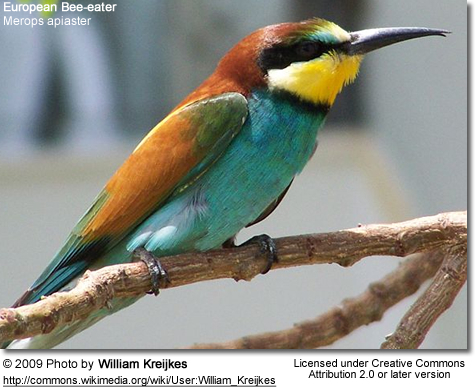 The slender European Bee-eaters measure 9.8 - 11.4 inches (25 - 29 cm) in length (including the two elongated central tail feathers) and have a wingspan of 14.1 - 15.6 inches (36 - 40 cm). Their average weight is 1.9 ounces or 55 g.
The plumage above is brown and yellow and the rump (lower back) is straw-colored. The wings and the long upper tail feathers are green. The plumage below is greenish-blue. The beak is black. The "chin" stretching to the "ears" is bright yellow, bordered below black. The eyes are reddish with a blackish, thick line through them. Juveniles have an entirely green back and their eyes are brown. 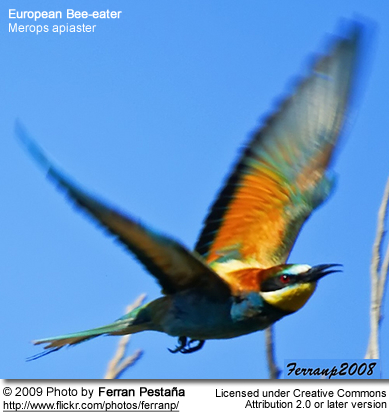 As is suggested by its name, the European Bee-eater predominantly eats flying insects - particularly bees (honey bees and bumble bees), wasps and hornets, but also dragonflies and other larger insects. They seize them after short dashes and take the insects back to their perches to eat. 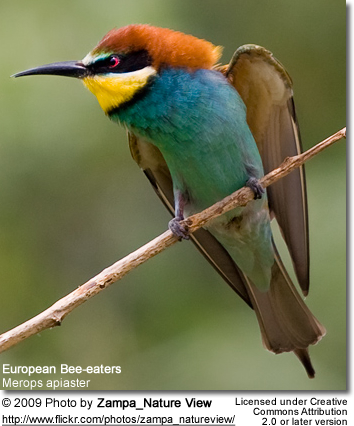 Before eating stinging insects, the European Bee-eater removes the sting by repeatedly hitting the insect on a hard surface to kill it, then wiping the insect's abdomen on the perch to discharge the sting. In Africa, their diet consists of stingless bees and many other insects as available in their feeding range. They feed on about 250 bees a day, which makes them very unpopular with bee keepers. They typically feed in open or at least semi-open country. 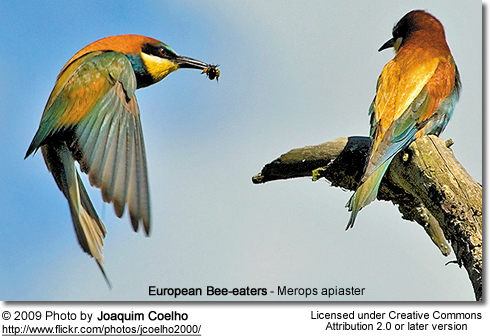 European Bee-eaters are colony nesters that typically breed in open country in warmer climates. They are generally monogamous (only one mate); although polygamy has also been observed in some instances. Breeding pairs nest in long, vertical nesting burrows that they themselves excavated in earth or sand banks, such as river banks or sand quarries. The tunnels are usually at least 3 feet (~ 1 meter) deep and terminate in a nest chamber. These nest burrows may be reused in consecutive years, but most pairs will excavate a new burrow each year. A clutch consists of 4 - 7 spherical white eggs, which are laid at 2 day intervals, and are incubated for 19 - 21 days. Both parents share the incubation tasks and raising of the chicks. In about one fifth of all nests, "helpers" (usually offspring from previous broods) will help raise the young. The young leave the nest when they are 21 - 32 days old. The parents will continue to feed them for a while after fledging as the young have to learn to catch insects on the wing (in flight) and to handle stinging insects. The call is a pleasant distinctive trill that sounds like a rolling ‘prrt’.